There are a couple of walnut trees outside, each one abundant with nuts just now. I picked one of the nuts up from the dozens carpeting the ground. Isn’t it amazing? 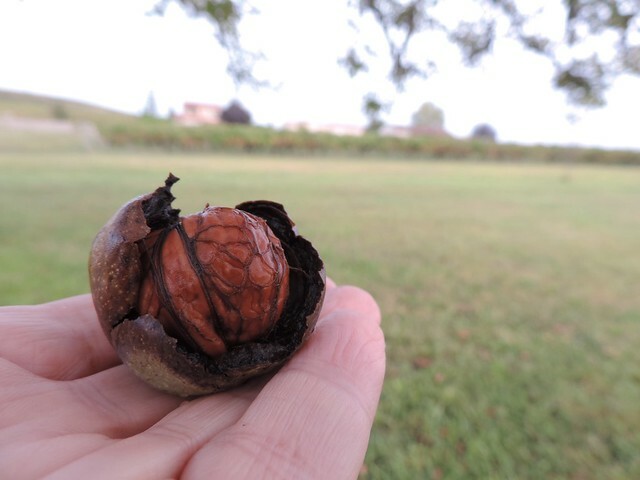 This incredible dark brown walnut emerging from its shell. Look at the patterns on its surface. See how those patterns are echoed in the lines of my skin? And, slightly disturbingly, doesn’t it look a little like a small brain? Lovely photo.The nut’s such a gorgeous colour. Eating walnuts is meant to be good for the brain, because it looks like one.